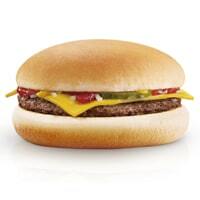 McDonald's is giving away free cheeseburgers to everyone so make sure to get yours from any nearest restaurant. Follow the link to their app and download it for your smartphone and take it to nearest McDonald's to get your free burger. Click on “GET IT HERE” button and then follow instructions given above to get your free cheeseburger.